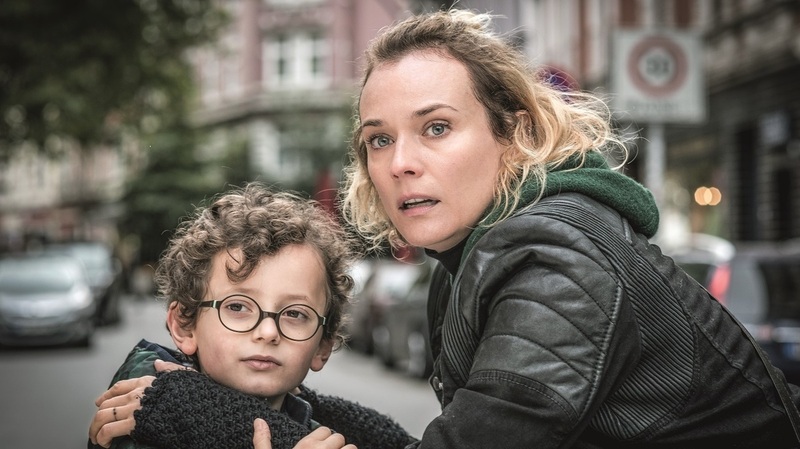 'In The Fade': A Fine Central Performance, An Uncertain Ending Diane Kruger won Best Actress at Cannes for her performance as a woman struggling in the aftermath of tragedy. Rafael Santana and Diane Kruger in In The Fade. Poignant and complex if occasionally frustrating, Fatih Akin's In the Fade is the story of a marriage. Not a conventional one, as the director announces with a prologue in which white-suited Nuri (Numan Acar) struts through a lineup of wedding-day well-wishers to meet his much-tattooed bride, Katja (Diane Kruger). Nuri's pals are fellow inmates, and the ceremony is performed in a prison classroom. Nuri was a drug dealer, and Katja met him as a client during her college days. Years later, the couple has become more bourgeois. They have a six-year-old son, Rocco (Rafael Santana), and Nuri runs an office where he assists other people of Turkish and Kurdish origin with their taxes, the German language, and other complications of living in Hamburg. This is familiar territory for Head-On director Akin, who's of Turkish descent but was born in Hamburg. Many of his films are set in the city, and they often involve cross-cultural romance, drugs, and rock'n'roll. In the Fade is named for a song by Queens of the Stone Age, whose Joshua Homme composed the movie's incidental music. The songs on the soundtrack come from several continents, but they're all in English. Akin divides the tale into three chapters, the first two of which are ironically titled. In "Family," Katja returns from an excursion to find that her husband's office was bombed. Nuri and Rocco are dead, and Katja must deal with her own grief was well as the demands and recriminations of her mother and in-laws. The police arrive soon, which leads to part two, "Justice." Set mostly in a courtroom, the chapter pits Katja and her loyal attorney (Denis Moschitto) against two neo-Nazis and their smirking counsel. (Co-writer Hark Bohm, a lawyer, was enlisted for this sequence.) The episode is fascinating, infuriating, and — when a forensic scientist describes Rocco's injuries — harrowing. The trial's verdict disappoints Katja, which sets up the last part, "The Sea." Newly inscribed with a tattoo of a samurai, the widow travels to Greece on the trail of the couple accused of killing Nuri and Rocco. She seeks revenge, but is ambivalent about her quest. That's her problem. Akin's is that any possible outcome indulges either vigilantism or despair (or perhaps both). Narratively, the final act doesn't work. Thematically, it's more interesting. In the Fade was inspired by the story of the National Socialist Underground, a neo-Nazi network accused in a series of murders of immigrants as well as the murder of a policewoman in Germany in the 2000s. The police who investigate Nuri's death want to know if he was involved with Islamic terrorists. But not all violence slots into ideological categories. In the Fade boasts an assured sense of style and a meticulously constructed script. Moments that initially appear to be asides turn out to be essential, and the final scenes of the first two chapters are vivid and startling. But its top attraction is the performance that won Kruger the best actress award at Cannes. The multilingual Kruger is known for playing characters who are poised, detached, and sometimes literally — as in Farewell, My Queen — regal. Here, she's believably scruffy and out of control, buffeted by emotion and circumstance. She lurches from chain-smoking to cocaine-snorting to thoughts of suicide, but is capable of tremendous acts of will when they're required. Will, however, may not be enough. Katja is still living the story of a marriage that's over, and struggling to write the conclusion. In the Fade suggests, perhaps unintentionally, that there is no satisfactory ending.